Kim Monroe of the Rock 98.9 radio station conducted an interview with QUEENSRŸCHE guitarist Michael Wilton and singer Todd La Torre before the band's November 15 concert at the Showbox in Seattle, Washington. You can now watch the chat in four parts below. Speaking about how QUEENSRŸCHE has moved on following a nearly two-year legal battle with its former singer Geoff Tate where Tate sued over the rights to the QUEENSRŸCHE name after being fired in 2012, Michael said: "It was a big transition. So we had some hurdles to go through. But it was needed. It was time to retool the machine, basically. So we've been just rebuilding the band for the last four years. And we've been touring quite a bit. And we've put out two albums since then. And the fans are totally supportive of the band and Todd; Todd's killing it now." Added La Torre: "We've established a lot of connections that, from what I understand, were broken connections and it was a disconnection between people in the industry. And we've gotten really great praise and support from the band's peers, so that's always encouraging. And these are people that don't have to say that, but they pull you aside and express their support, and that's always nice. And, of course, the fans of the band seem to feel and express that they have their band back. And so we're really kind of honoring the legacy of the band while still creating new music and trying to show that we're still relevant and we're not just playing the classics and not creating new music." Asked if there is any chance of QUEENSRŸCHE revisiting the "Operation: Mindcrime" storyline and releasing another sequel to the band's 1988 masterpiece, Michael said: "A lot of people suggest that, but I think… Who's to say that we'll come out, maybe, with a thematic or a conceptual album. But that one is parked and… It's a timeless endeavor that is so special to people. And usually sequels are not as good in the movie industry and in the music industry." He continued: "I think [our current lyrical approach has] more [to do with] our surroundings, what we're feeling, what we're going through, how we're impacted by certain things. And it all kind of filters down into a creative, artistic way of expressing what's happening rather than being so blatant and in your face. I think if something can have different meanings to everybody, I think it's more fun for the listener." Todd concurred, explaining: "It's funny when you write something and you think that you know what that means and where it came from, and then you maybe read an [interview] with the songwriter, and he says, 'Well, actually, I just wrote it 'cause it rhymed. It didn't mean anything.' And people kind of feel let down. But the fact that there is that… you know, it's open to interpretation, is great." He added: "There's a lot happening in the world, [and] there's so much content to write from. And for me, I write most of the lyrics in the band. Of course, anyone [in the band] can write, and I'll sing whatever — I don't stifle anyone's lyrics — but usually my inspiration comes from sadness, it comes from tragedy, it comes from darkness, it come from bad things. But I always try to find a twist, to find the way out — a positive spin at the end. Because I don't think I've ever written a happy song in my life; it always stems from something really sad that really… it taps into people. And if you can come out with a positive angle, then all the better." 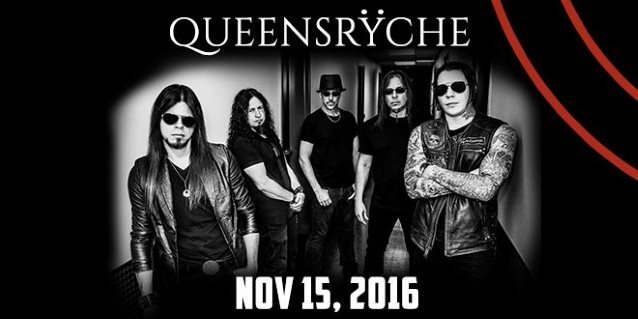 QUEENSRŸCHE is in the middle of a month-long headlining tour of the United States. Support on the trek is coming from ARMORED SAINT and MIDNIGHT ETERNAL. 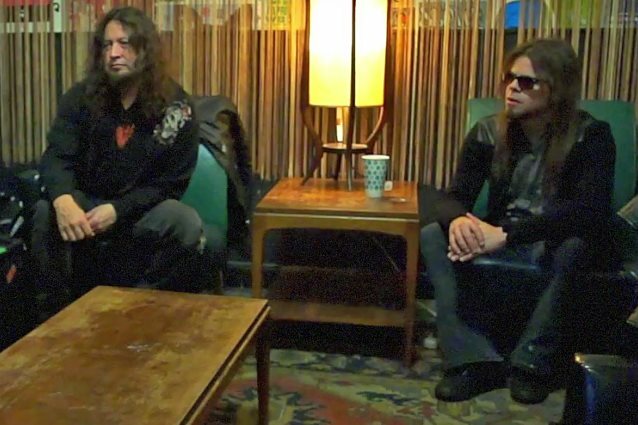 In April 2014, Tate and QUEENSRŸCHE announced that a settlement had been reached whereby original QUEENSRŸCHE members Wilton, Scott Rockenfield (drums) and Eddie Jackson (bass) would continue as QUEENSRŸCHE, while Tate would have the sole right to perform the albums "Operation: Mindcrime" and "Operation: Mindcrime II" in their entirety live. QUEENSRŸCHE's latest album, "Condition Hüman", debuted at No. 27 on The Billboard 200 chart, having shifted 14,000 equivalent album units in the week ending October 8, 2015. The band will enter the studio in January 2017 to begin work on the follow-up effort, to be released via Century Media.